A number of accessible benches have been installed around a popular walking route in Patchway. 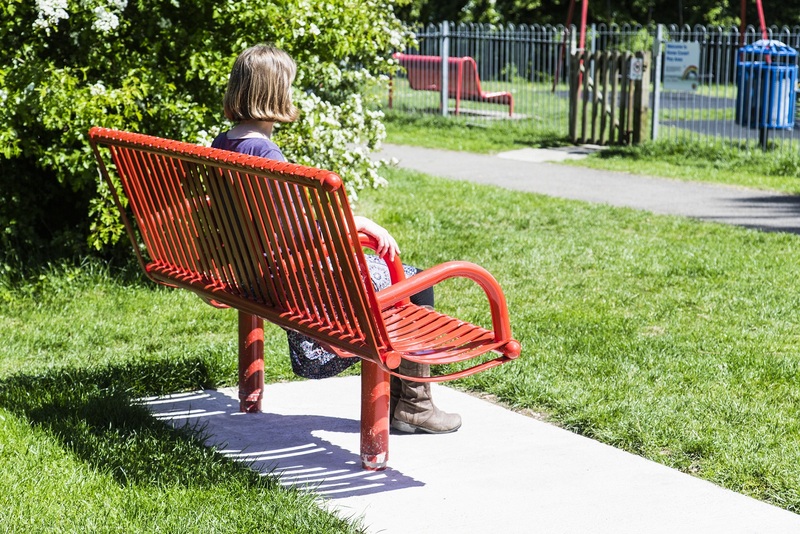 Six bright red ‘Balmoral’ style benches have been positioned at various points around the Patchway walking trails which link routes in the area to local amenities including shops and health services. The benches have been specially designed to be accessible to a wide range of people, including those with dementia, and feature individual arm rests which help people to lift themselves out of the seats. A flat concrete platform has also been added next to each bench to enable wheelchair users to safely position themselves alongside. Subitha Baghirathan, Development Officer at South Gloucestershire Dementia Action Alliance, said: “The new red benches in Patchway are almost like a badge that shows the area is committed to being a dementia-friendly community, following the very successful pilot programme over 2013-14, coordinated by Eleanor Fairbrother at Southern Brooks Community Partnerships. There is now a thriving Memory Café in Patchway, 70 local businesses and organisations became members of the local Dementia Action Alliance, and a film was made by pupils at Patchway Community College and members of the Memory Café in 2014. One of the benches is located on the corner of Bradley Road and Durban Road, two are on Cranbourne Road opposite Highwood Road, one is on the corner of Rodway Road next to Callicroft Primary School, and two are on the green space next to the play area adjacent to Callicroft Primary School. The benches have been funded by the Local Sustainable Transport Fund (LSTF).